Before I start my rhapsody on the glories of bacon and Sriracha, let me just confess that this wasn’t my idea and isn’t my recipe, which is why we’re posting it on Whatever Wednesday. For that we can thank Scott Hutcheson, whose recipe was provided in his blog, and then was picked up and discussed by another blog, True Laurel, where one of my friends saw it and pinned it on Pinterest. I had to try this. 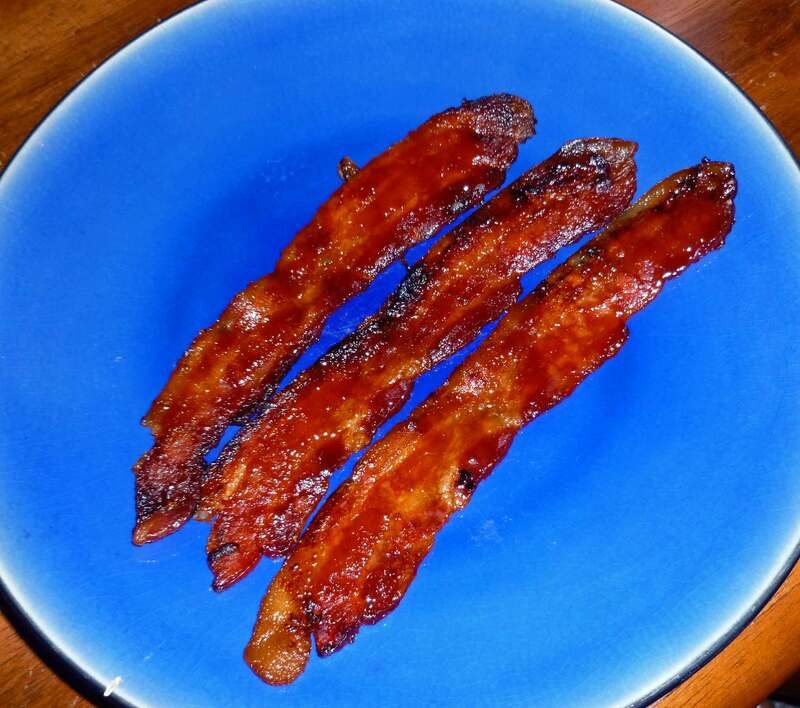 I’ve made some minor modifications, because I’m used to cooking my bacon in oven, I like it really crispy, and I’m way too lazy to use a baking rack and then have to wash it afterwards. 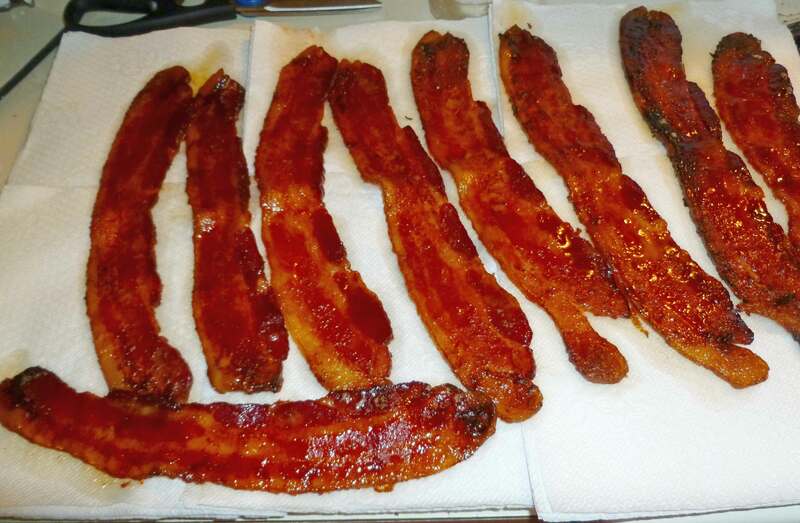 It works perfectly fine just on the baking sheet or piece of stoneware (but it does work best on the stoneware between the two), but you will want to use some tongs to remove the bacon from the baking sheet and place them on a sheet lined with paper towels to drain after baking. Okay, I’m beginning the rhapsody. Two of my favorite foods in the whole world, together at last. (Sounds like an ad for an duet album on TV when they still had ads like that right?) In any case, the guy who thought this up was a culinary genus. It’s beyond awesome. Preheat your oven to 375°F. 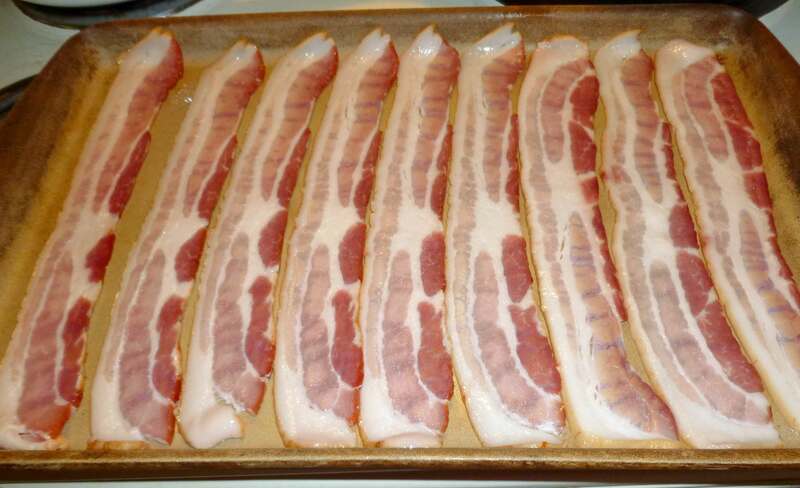 Lay your bacon strips out carefully so they do not overlap on your baking sheet or stoneware. (I’m using the Pampered Chef large bar pan stone. 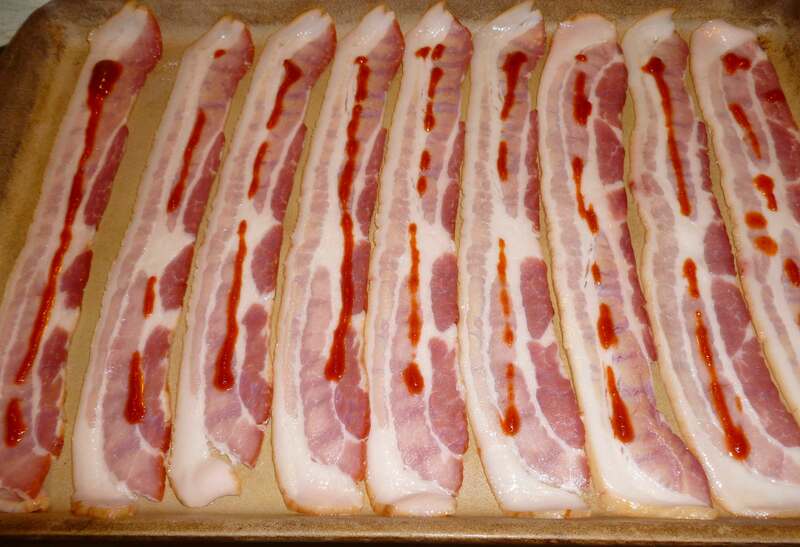 Take your Sriracha bottle and run a line of Sriracha down each strip of bacon. 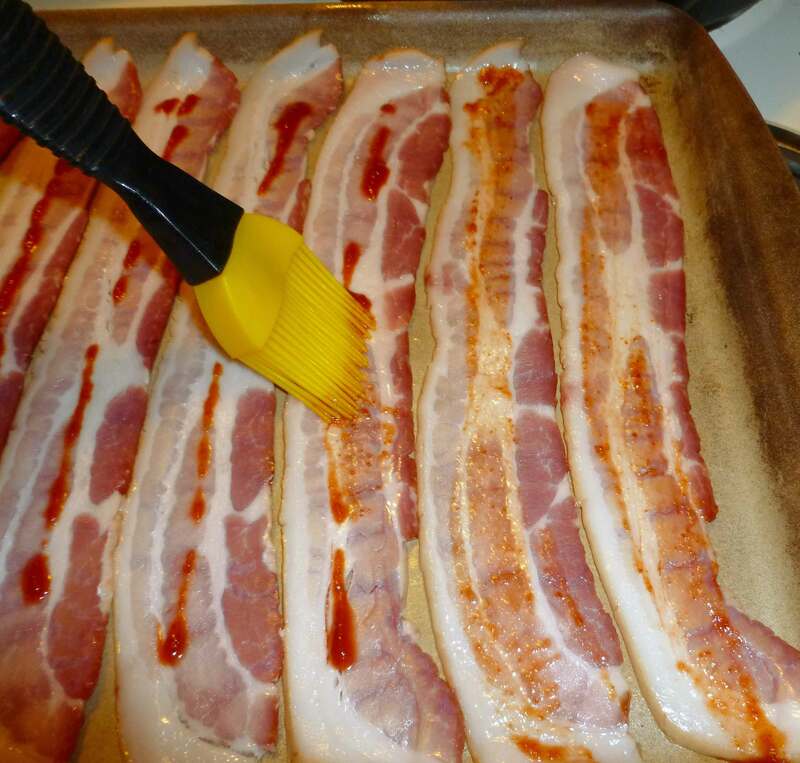 Once you have the Sriracha on the bacon, take a basting brush and spread the Sriracha evenly over each strip of bacon. 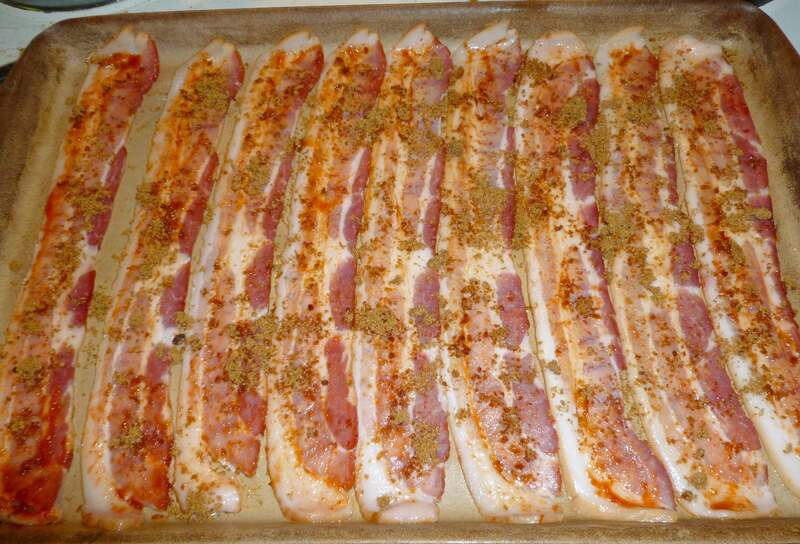 Now sprinkle the brown sugar evenly over the bacon strips. I found it was easiest just to use my fingers to do it. Bake for 15-20 minutes. Check on your bacon at about 15 minutes so it gets to the proper level of “done-ness” for you. Again I like mine really crispy, so I’ll let mine go longer until it’s where I want it. 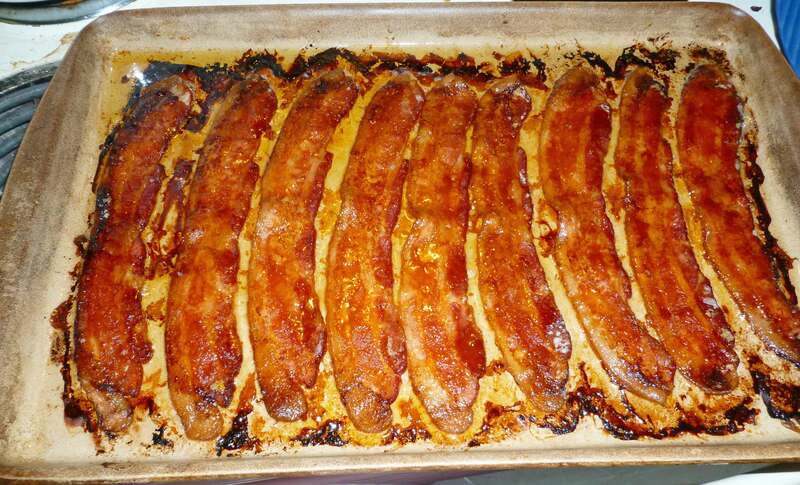 Once it’s out of the oven, use a fork or a pair of tongs to lay them on some paper towels to drain away the excess bacon fat. Enjoy, it’s really, really good! This looks really good – I think I might be able to get half of my friends to eat this – the other half is NOT fond of spicy food. Maybe do one spicy pan and one with just brown sugar? So far as I can tell, there’s no such thing as too much bacon at brunch! You can never have too much bacon no matter the time of day – AMBROSIA! It was seriously luscious. And the sugar was an complex note with the smokey bacon, so I bet it would be good even without the Sriracha, heresy though that may be.